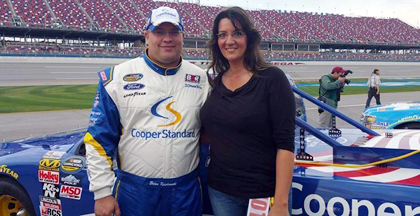 NASCAR Race Mom: Big Brother Brian Keselowski; Happy Ever #NASCAR Ever? Event; but no storybook ending. Michigan International Speedway after a won the GM Goodwrench 200 ARCA series race. Racing runs through the Keselowski blood. Before Brad and his big brother Brian began racing in the 1990s, and even before their Father Bob and Uncle Ron began racing in the 1960s, Brad and Brian’s grandfather John Keselowski was the family’s competitor in motorsports. John raced motorcycles and other forms of motorsports in the 1940s and 1950s before turning to stock car ownership after a bad wreck. Bob won the ARCA championship in 1989. Uncle Ron can boast of sixty-eight (68) Cup Series starts (between 1970 and 1974) with two top-five finishes. This last week, Brad Keselowski thrilled race fans by offering less-known brother Brian his shot at the big leagues by driving the #29 Cooper Standard Ford F-150. Brian was quick to impress all from the start, showing speed and skill during practice. Brian qualified just out of the top-ten. What an awesome NASCAR story-line it would be if Brian could secure his traction as a NASCAR driver by winning for his brother in the Camping World Truck Series. 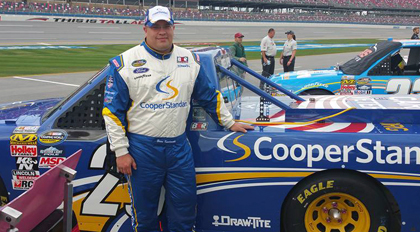 After all, when the loss of a main sponsor cause the Keselowskis to shut down the family team, Brad went out and pursued his driving career with other team owners in the Truck Series. This is where Brad had an impressive drive that caught the eye of a man named Dale Earnhardt Jr. and the rest — of course — is history. Would history repeat itself? In his Truck Series debut, Brian Keselowski (@KeselowskiBrian) who was subbing for injured driver Austin Theriault, was in position to pull off a stunning “fairy-tale” upset at Talladega’s 2.66-mile Superspeedway. Brian was in third for the green-white checkered dash to the finish but ran out of fuel before taking the green flag. He was able to coast to pit road for a splash of gas to make it to the checkered flag but any chance of a good finish was gone. Brian was credited with seventeenth place in the final rundown. "I'm emotional," Brian reported. "I'm really proud of how we ran. I'm disappointed that it was probably my only chance. We'll see how it works out." 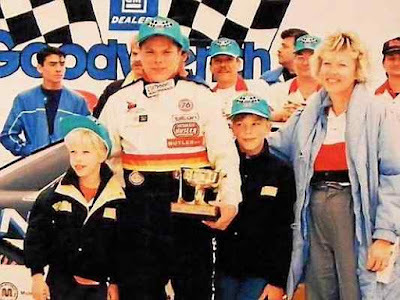 Keselowski, who had never before driven for his brother Brad, believed that he was going to make it to victory lane in his first Truck Series race until his fuel problem. "They said right from the get-go to save fuel, and I was," Keselowski said. "But you can only do so much when you're leading. You've got to go, so I didn't save any when I was out front. I guess I should have, but that's a little bit of inexperience in the Truck Series probably showing up. We'll learn better next time." So no story book ending . . . this time. However, Brian was able to showcase his value. This fan was on the edge of her seat for the entire race and is hopeful to see much more of the older Keselowski! I like this article Z! Good to highlight Brian K in this way. Hope that he get more chances later. What a wonderful article you wrote! I wish I seen it sooner! Thank you very much for your kind words about Brian and I will make sure he sees this asap!